I have seen KISS perform live countless times, but witnessing the first night of their Las Vegas residency was one show that I was really looking forward to. The reason for that of course had a lot to do with seeing the iconic KISS once again, but also because my wife would be accompanying me for the first time to a hard rock concert — INXS and U2 don’t count in my view. It only took 16 and a half years to get her to catch this type of spectacle with me, so I thought it was best to have her attend the most over-the-top hard rock extravaganza that there is — a KISS show. The back story is that for the last six years my wife had been proposing that we venture to Las Vegas, but I had always declined — citing other places that I would rather visit. Apparently, my significant other had had a great time in the City of Sin with some girlfriends six years ago. When I found out that KISS would be playing a number of shows at The Joint, inside the Hard Rock Hotel & Casino, in November — and unfortunately having to miss their Toronto stop with Def Leppard this summer — I shamelessly made my Vegas presence conditional on both of us attending a KISS concert while there. My wife reluctantly agreed, and after I secured two tickets to the opening night on November 5th, we set out to plan the rest of our Vegas trip. 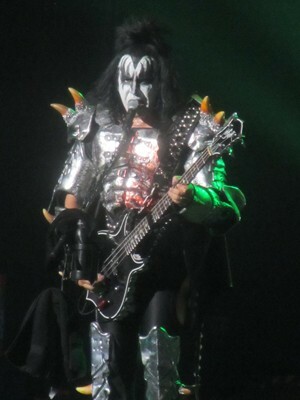 Although I tried to introduce some KISS classics to my Top 40 dance-music loving wife over the last few months, the reality is that she was far more looking forward to the possibility of spotting Gene Simmons‘ spouse Shannon Tweed at the concert than becoming familiar with and hearing any KISS music. That is truly the power of television, as my wife is more familiar with Simmons and his family through their Family Jewels “reality” TV program than for any of KISS‘ exploits and music! If it wasn’t for Family Jewels, she likely would have no idea who KISS is — aside from a bunch of guys who made it big while wearing make-up and strange costumes. I have to give a lot of credit to my wife for really getting into the spirit of things, since she purchased make-up for both of us to don while attending the concert — her as The Starchild and I as The Demon. Funny enough, despite being a huge fan for almost 30 years now, I had never previously put the classic KISS face-paint on. Alas, it was not meant to be because we both forgot to pack the make-up in our luggage, but thankfully I didn’t forget about the tickets. We arrived at the Hard Rock Hotel & Casino ten minutes prior to the doors opening and there was already one huge line-up from the venue’s entrance well into the casino. Upon seeing all the concert goers, my wife exclaimed that she must be the youngest one there — and it did seem that way until we saw a few kids in the audience later on. The line-up was moving very quickly and from our vantage point, in section 101, it seemed that KISS had sold out the first night of their Las Vegas residency. I wondered, but doubted, if there would be an opening act and my thoughts were soon confirmed when the familiar intro of, “You wanted the best. You got the best. The hottest band in the world… KISS” was heard. The curtains dropped and the flood of visual stimulation was intense as KISS launched into “Creatures Of The Night” and “Psycho Circus”. I quickly gave the camera duties to my wife, partly because she would most likely be a better photographer than I would be, and partly to keep her occupied through a potentially long night (for her) — this ended up working very well as she took her camera duties seriously and captured far better photos than I could have. Being the true professionals and seasoned veterans that they are, all of the band members in KISS were, as usual, in fine form. I was particularly pleased when KISS dug deep into their song vault to play “Parasite”, from their second record ‘Hotter Than Hell’, and “War Machine”, one of my favorite Simmons sung songs. Aside from the omissions of “Deuce” and “Watchin’ You”, all of the songs handled by Simmons were in my opinion his best KISS tunes, which included “God Of Thunder”, the sing along classic “I Love It Loud” and “Let Me Go, Rock ‘N’ Roll”. 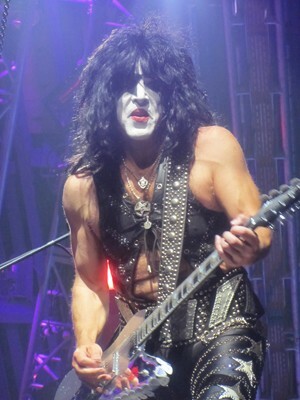 There has been a lot of talk over the last few years that Paul Stanley‘s voice is not as good as it once was, but I thought that he sang really well on the opening night of KISS‘ Las Vegas residency. The only noticeable change was that he sang the verses of “I Was Made For Loving You” in a much lower register than what is heard on ‘Dynasty’. 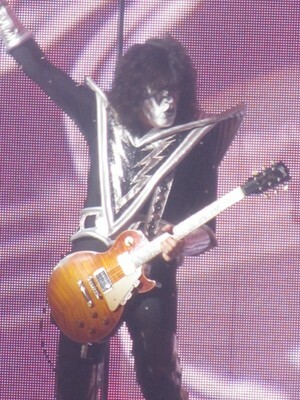 However, Stanley did hit all the high notes right before Tommy Thayer‘s guitar solo during that song. My wife, who really was not familiar with the KISS frontman, noted after the show what a great voice he had and was not surprised when I informed her that Stanley had previously done a six-month stint as the Phantom Of The Opera in Toronto. 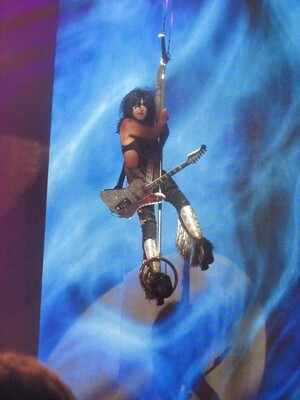 Given that The Joint’s venue is smaller than what KISS is accustomed to, the band’s giant “spider” of lights was missing. In addition there were some modifications to some of the usual acrobatics that Simmons and Stanley would regale the audience with. Rather than being hoisted above the rafters after his blood spitting bass solo, Simmons was simply lifted about half the height onto a platform near the venue’s ceiling. The platform then moved forward for the entire audience to get a good glimpse of The Demon singing his trademark song “God Of Thunder”. 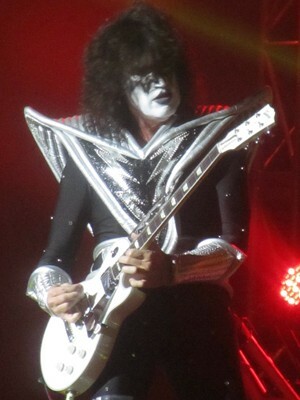 For over ten years, Stanley has flown over the audience to play the classic “Love Gun”, but this time he “flew” onto a side platform to the right of the stage — which happened to be where our seats were located — before “flying” across the audience to a podium to the left of the stage where he played the intro to “Black Diamond”. I thought that the cheesiest moment in KISS‘ set was when Stanley asked the audience to scream his name loud enough to top the volume meters that appeared in lighted format on both sides of the stage so that he would be invited to join (“fly” over) the crowd. I was quite surprised that after asking me what Stanley‘s name was, my wife fully participated for the first time of the night by screaming “Paul” when cued at the top of her lungs! That is really the beauty of KISS — what I might, as a long-time fan, find cheesy was what really engaged a new fan such as my wife. 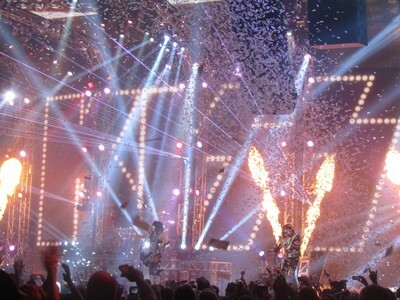 As expected, KISS had more explosions, lights and special effects (such as fire spewing) than the last time I saw them — and given their global reputation, even my wife was expecting such a grand spectacle from the band. I was very pleased overall with the setlist, and particularly the beginning with the inclusion of “Parasite” and “War Machine” but also “Tears Are Falling” from ‘Asylum’ and “Hell Or Hallelujah” from ‘Monster’. 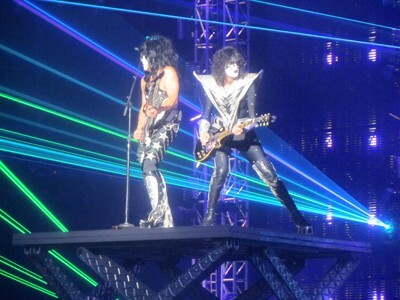 The latter was described by The Starchild as one of the newer songs that will become a KISS classic — to which I agree. Usually I would have liked to hear more songs from the headliner, and in particular since there was no opening act, but given my sidekick for this show sixteen songs was just right. I took it as a good sign that it was only during “Black Diamond” that my spouse asked me how many songs were still going to be played. What was quite unexpected, and certainly won KISS many brownie points in my wife’s view, was that the band and a number of other dignitaries presented a totally renovated 100% mortgage free home in Las Vegas to a war veteran (whose name unfortunately escapes me at this time) who had been injured during combat in Afghanistan and had received the purple heart for his efforts. KISS once again showed their support for all the war veterans out there and it was touching to see. The concert closed with three sing along classics and encores from the iconic rockers — “Shout It Out Loud”, “I Was Made For Loving You” and the ultimate show closer “Rock And Roll All Nite”. While KISS may not have converted my wife into a metal queen, she did leave the concert with a new found respect for the band and declared that she enjoyed the show more than she thought she would — mission accomplished. 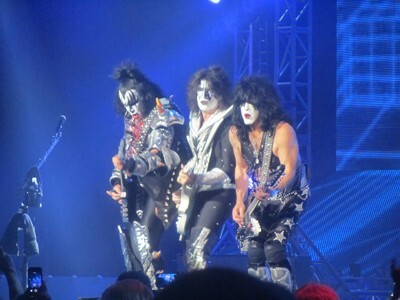 Thank you KISS for another awesome show and for all of your music in the last 40 years.